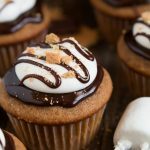 Celebrate National S’mores Day with S’mores Cupcakes that have milk chocolate ganache and fluffy marshmallow frosting on top of a graham cracker cake. 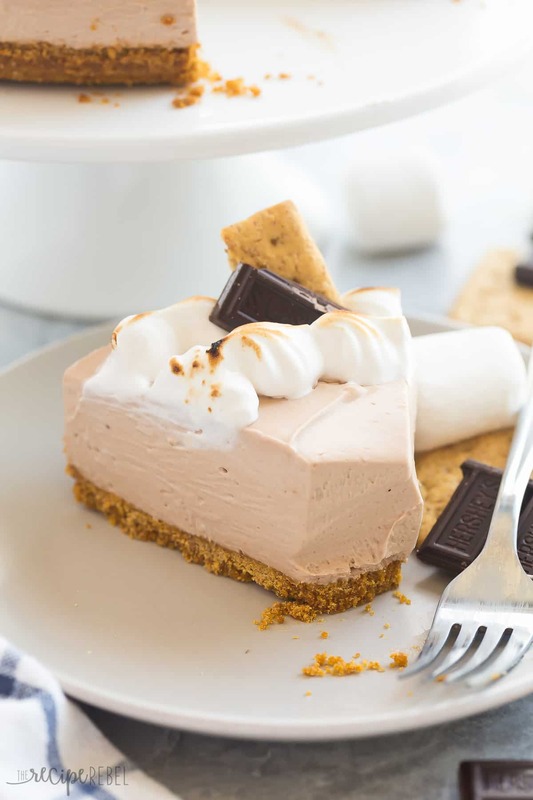 Who doesn’t love a warm toasted marshmallow and melted milk chocolate squished between two cinnamon honey graham crackers?! Gosh s’mores are delicious. They are one of my favorite things about the summer. I have so many good memories roasting (and burning) marshmallows with family and friends on warm summer nights. Usually we make s’mores around a bonfire but last time we used a gas barbecue grill. It actually worked quite well and we laid the chocolate on the crackers on the higher rack so it got all melty. Mmmm. Melted chocolate makes me happy. 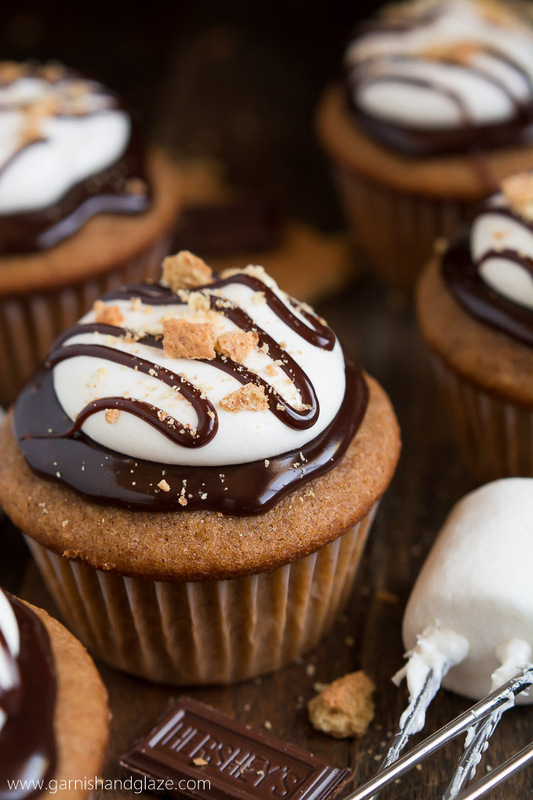 Anyway, when you don’t have a fire pit or a grill but are in dire need of marshmallow, chocolate, and graham cracker, then you’ve gotta make S’mores Cupcakes! 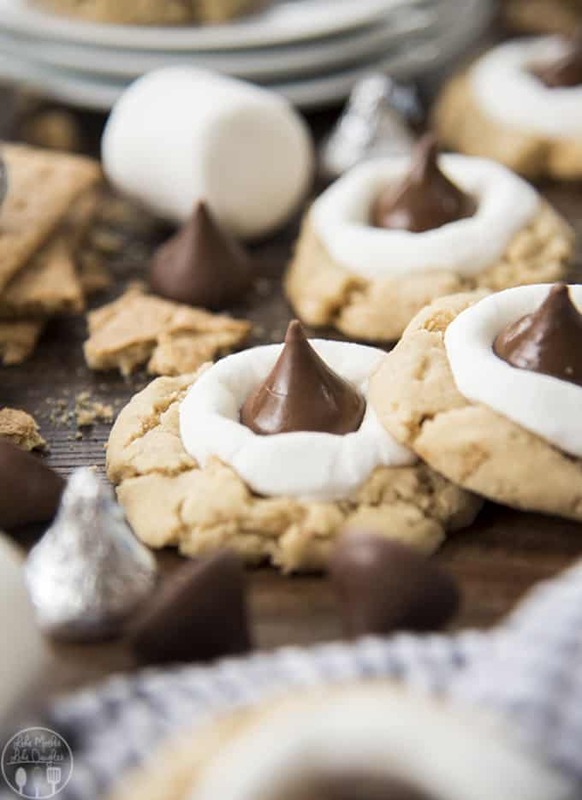 So I’ve seen lots of awesome S’more Cupcakes online but I didn’t want to have to bother getting my thermometer out to make marshmallow frosting over the stove using egg whites and I didn’t want the mess of dealing with sticky toasted marshmallows or have to buy a kitchen torch. I wish I had one but I can’t justify buying one to only use once a year. 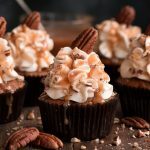 The scrumptious cupcakes have graham cracker crumbs mixed into the batter giving the cake that classic graham cracker taste. 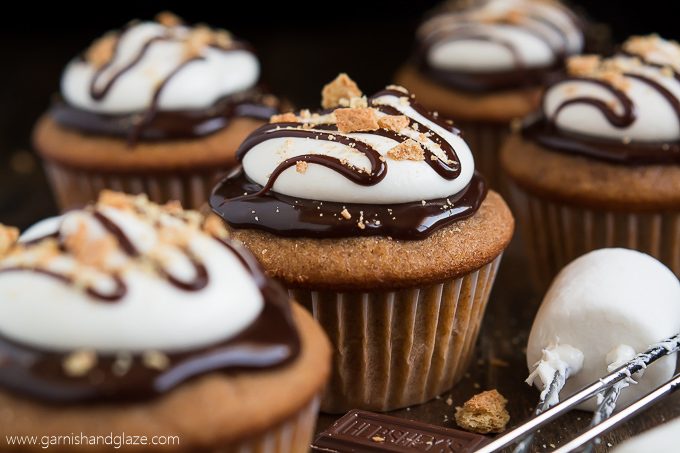 On top of the cupcake is milk chocolate ganache. If you couldn’t tell, I really like ganache on cupcakes (Raspberry Chocolate Cupcakes, Samoa Cupcakes, Pumpkin Cupcakes). One thing I learned while making this ganache is that the amount of cream needed depends on the type of chocolate you use. Milk chocolate already has more milk in it, making it softer and therefore needs less cream when making the ganache compared to when using dark chocolate like in my other cupcake recipes. Anyway, then on top of the ganache is a super easy marshmallow frosting made with marshmallow fluff. You guys are going to LOVE these! Enjoy! Preheat oven to 350 degree F and line muffin tins with paper liners. 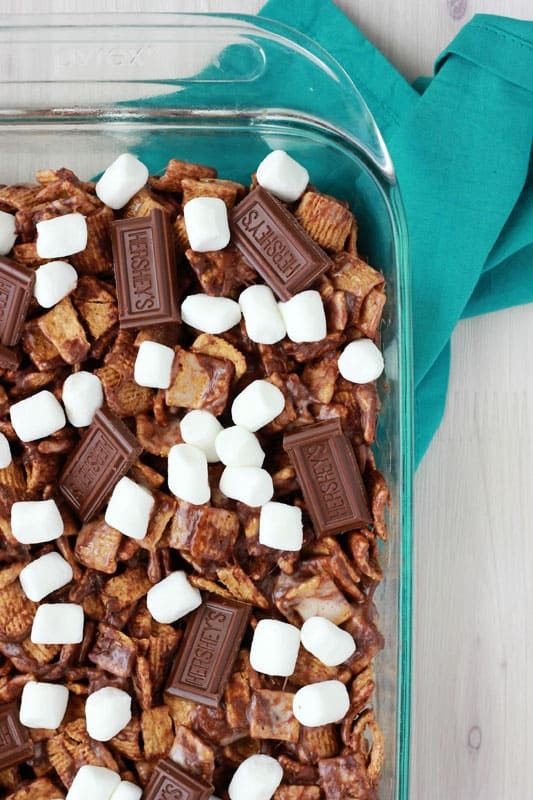 In a mixing bowl, combine flour, graham cracker crumbs, cinnamon, baking powder, baking soda, and salt. In another bowl, melt butter. Whisk in the sugars. Then mix in the buttermilk, egg yolks, and vanilla. Add the liquid ingredients to the dry and mix until just combined. Set aside. With and electric mixer, beat egg whites until soft peaks form. Fold into the batter until combined. Bake for 15-17 or until toothpick comes out clean. Let cool in muffin tin for 5 minutes and then remove and cool completely on a cooling rack. In a small sauce pan, combine chocolate chips and whipping cream over medium-low heat until melted and smooth. Let it cool for 5 minutes and then spoon onto the center of each cupcake. Let the ganache set up on the cupcake before adding frosting (put in fridge for 5 minutes to speed this up). Place remaining ganache in a piping bag or ziploc baggie. 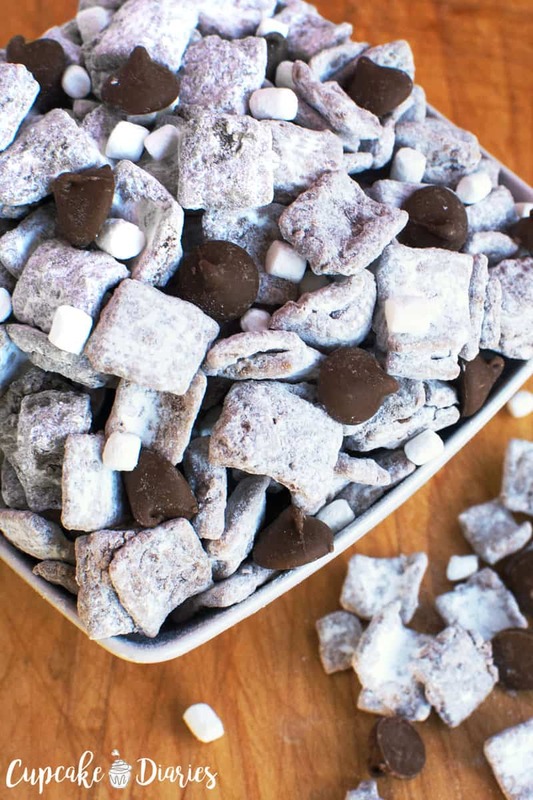 Beat the butter and powdered sugar together until fluffy. Fold in the marshmallow fluff by hand. Place in piping bag fitted with 1A (extra large round) tip or just cut the tip of the bag off. Pipe on frosting. 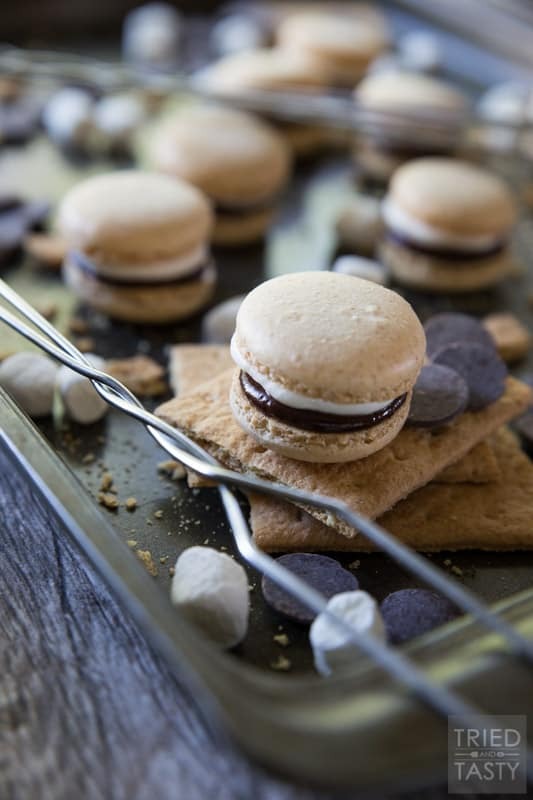 Drizzle with leftover ganache and sprinkle with crushed graham crackers. 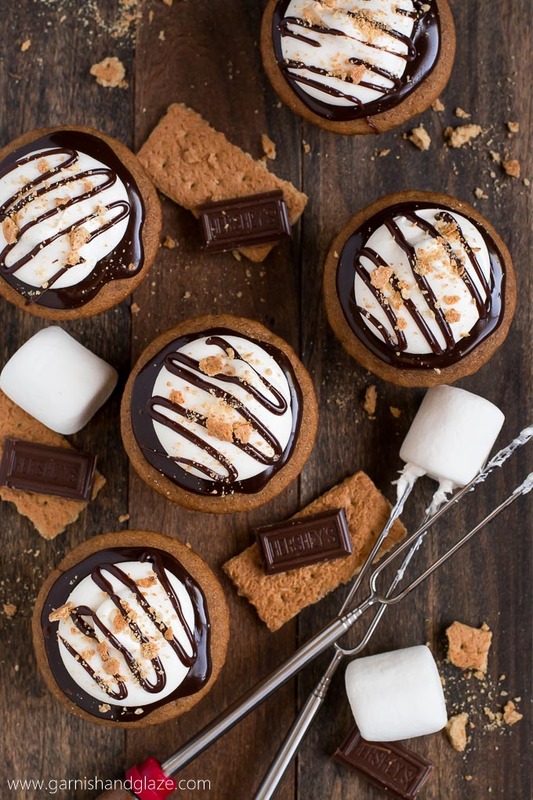 Need more s’mores? 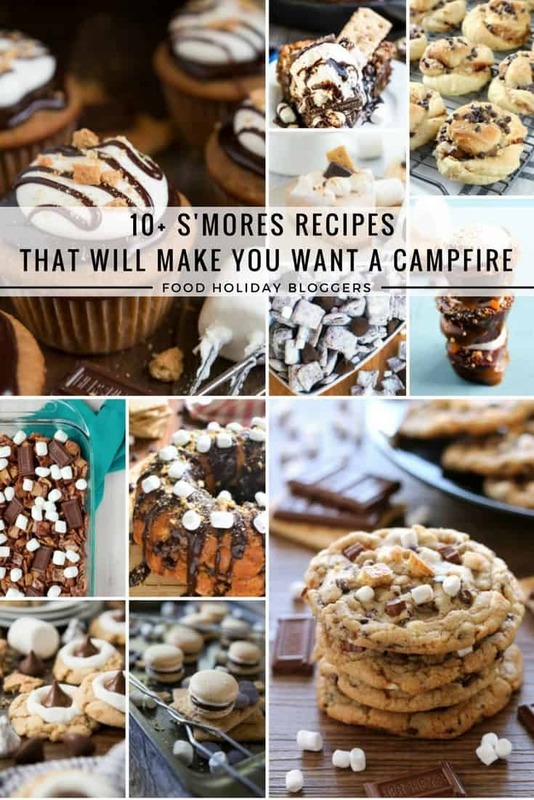 Try 9 more awesome s’mores recipes from my favorite blogging buddies! Oh wow these look scrumptious! And I love this marshmallow frosting, so much easier! 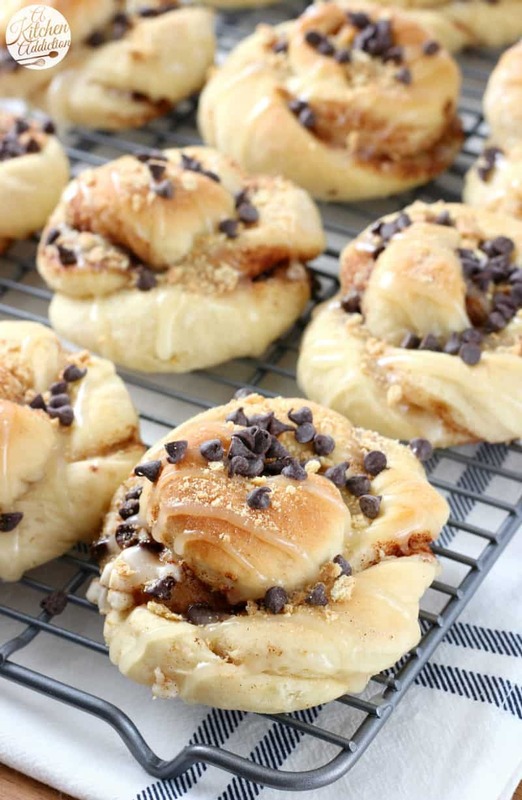 Oh it’s WAY easier and still so yummy! Thanks Heather! Well these look incredible! We’ll have t o make them for FHE next week! Thank you Paige! 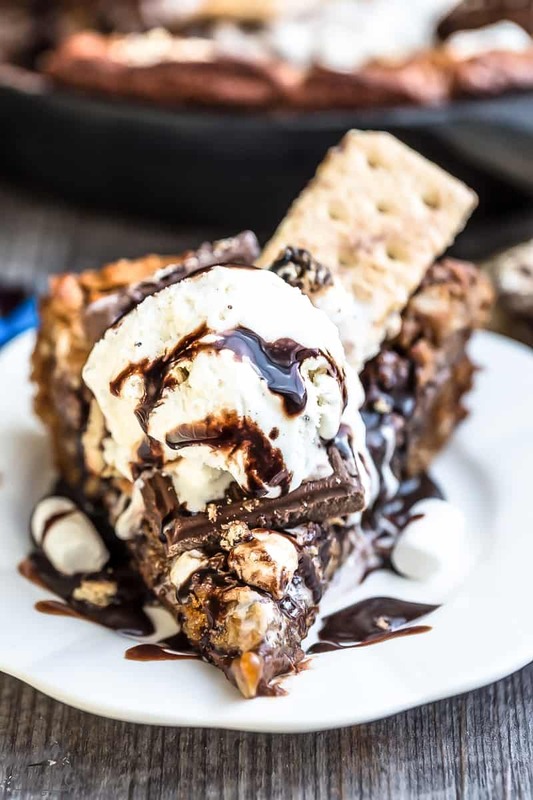 That would be a perfect dessert for FHE! I might just have to carry on with the celebration after seeing these! Love love love that gnache! So yummy! I love that you used marshmallow cream in the frosting instead of making it over the stove — it can be such a pain and takes so much time! I can just imagine how incredible these are! Okay, these cupcakes are genius. 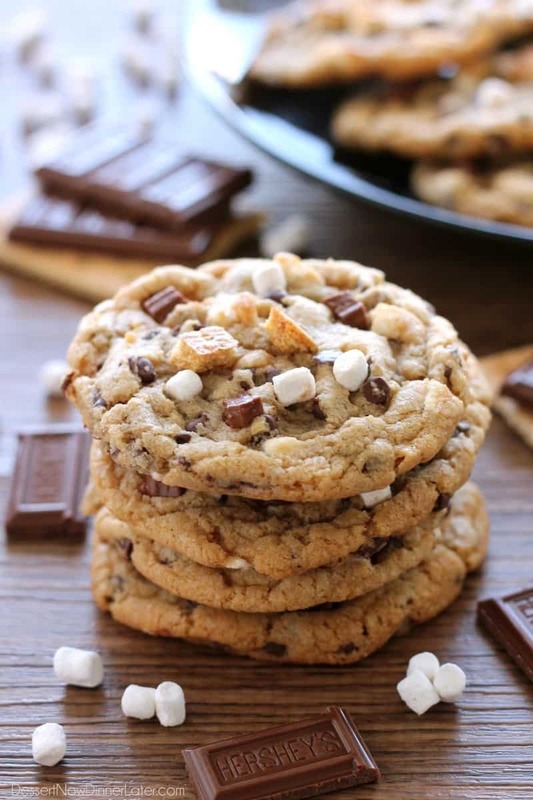 Seriously I’m with you and I am smores obsessed! 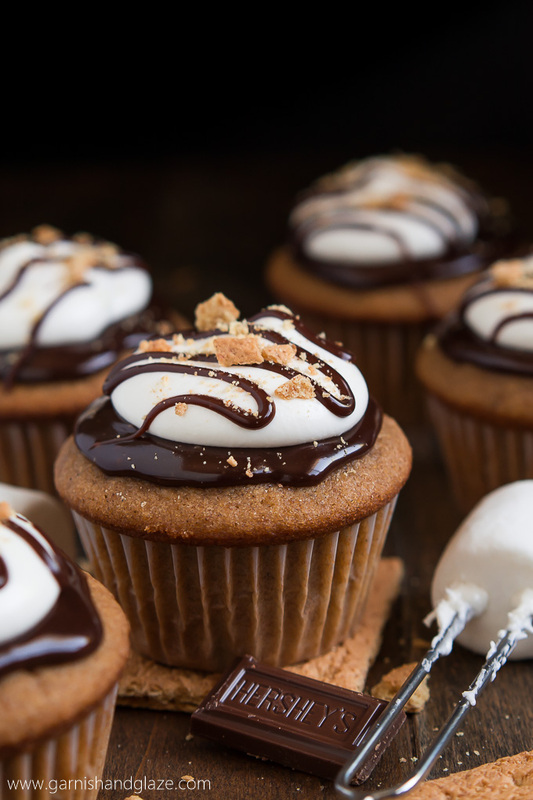 So a graham cupcake, that ganache, and that homemade marshmallow frosting?! I’m all drooly over here just thinking about it! These are gorgeous! 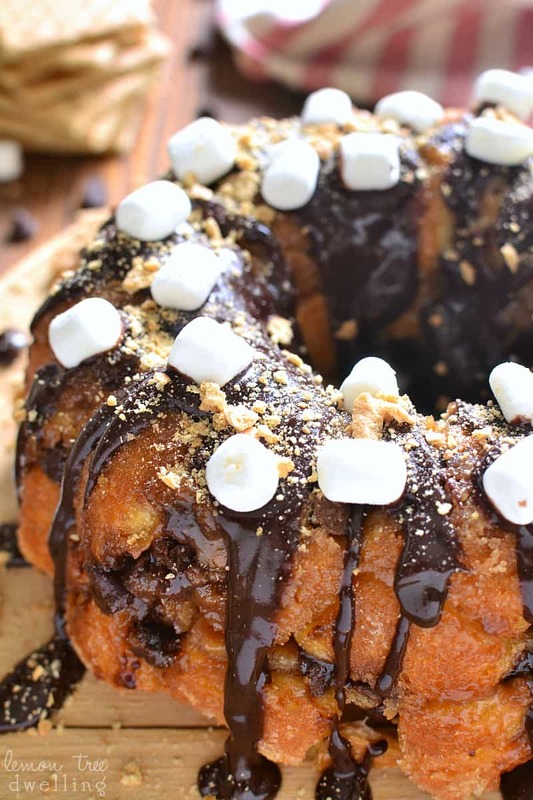 Love the marshmallow frosting! These are so cute! 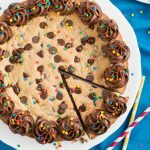 I love that you have graham cracker crumbs in the cake too! Perfection! Hey there! Thanks for the great recipe 🙂 I was just wondering if this icing will hold its shape if piped? Thanks for the great recipe! I was just wondering if the icing will hold its shape when it’s piped? Bethany, It’s not a stiff frosting. It kinda droops like a melting marshmallow. Hi! Thinking i will try this recipe! Have you ever made the frosting in advance, might need to make it a 2 or 3 days ahead of time. Thanks! I haven’t made it in advance, sorry. It’s a really simple frosting so it doesn’t take much time to throw together to pipe on fresh. Can those cupcake go in the freezer? They can go in the freezer unfrosted. Your cupcakes are really good. I would suggest that the ganache needs to be a little firm to put it on top of cooled cupcakes, and the frosting needs to be quite cool to keep it from toppling over. The ingredient list is right on the mark, both taste-wise and amount-wise. I did put some little teddy grahams and a little piece of milk chocolate on top of the drizzled cupcakes. They will be a hit tomorrow—I’d guarantee it! Thanks! 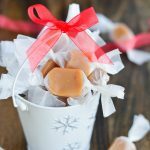 I just made these today and they were amazing! 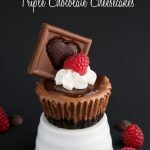 My favorite cupcakes ever! 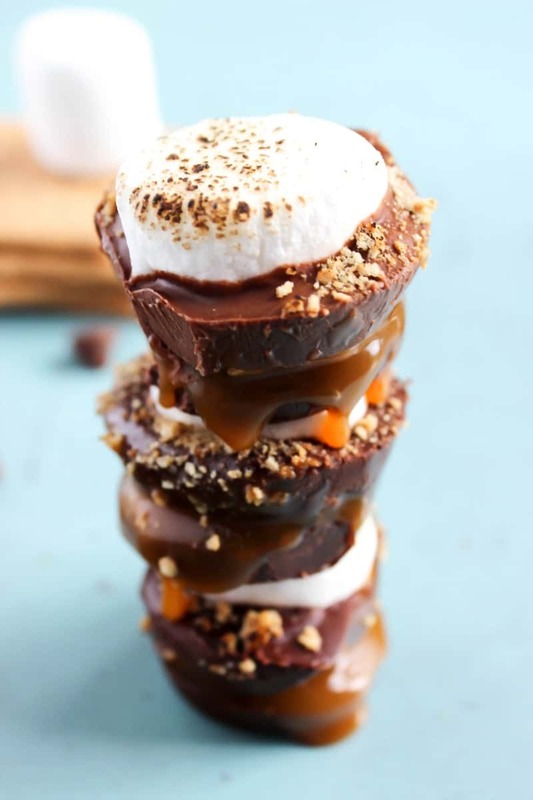 I’m a big fan of anything S’mores. I did have a question though. My frosting seemed a bit runny which made the eating the cupcake messy. I’m planning on making these for a party and wouldn’t want everyone getting messy. Do you think it was runny because I used too much marshmallow fluff or too little? Thanks in advance!